This is the cover for my new e-book to be published on Amazon Kindle before the end of the month. I love the cover because it takes place in the summer of 1927 before “The Jazz Singer” opened up and changed movie history. 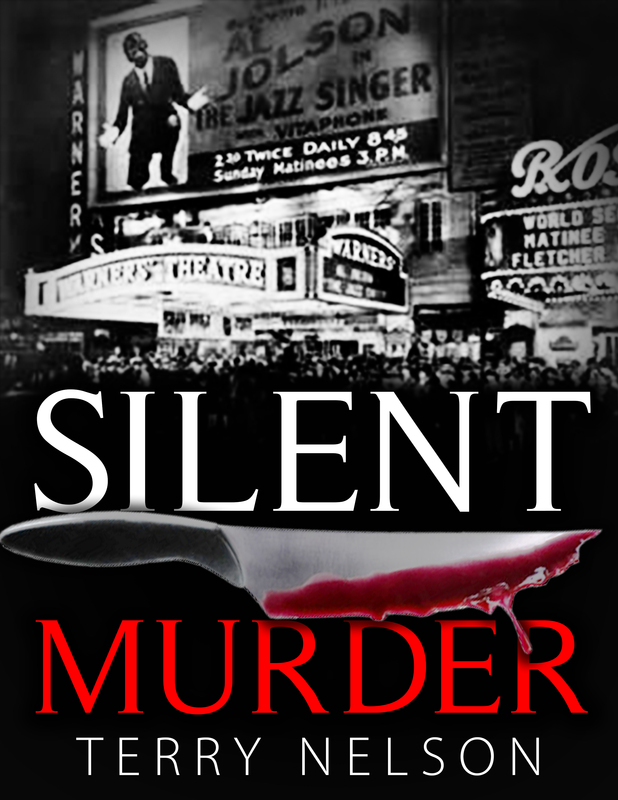 The novel is about a serial killer murdering sound technicians at movie studios, trying to prevent sound movies. The murder weapon is always a knife, and the killer is always silent in his attacks. I love the way Silent is in white and Murder is in red. I find it eye catching. It might even be better than the story. Covers are the key. They are the first impression; it brings the reader to click the buy button. I like the cover so much I think I will even buy the book. When I wrote my first e-novel “Loonies in the Dugout” the word piffle came out of the mouth of Eveleen Sullivan. It was a serendipitous writing moment. By that, I mean, it was an automatic response her character gave to something someone said. At the time I had no idea of the origin of the word, nor what it meant, nor even if it was a word. I just liked the sound of it and I liked the idea of it being a character signature for Eveleen. So she said it at appropriate moments-for her of course, I had nothing to do with it. I may be a writer, but I will not put words in characters mouths. They think and talk for themselves you know. In truth I had no idea how the word came out of my head-or into Eveleen’s mouth. I must have heard the word at some time, or read it somewhere, and it just lodged deep in my memory bank waiting for a withdrawal. Then it just popped out while writing. It is one of the joys of writing. So I did some research. Apparently it came into use about 1890. It was slang , origin unknown, to describe words or ideas that are false or silly. According to American Heritage Dictionary: To talk act in a foolish, feeble, or futile way. Nonsense-noun. And nonsense is what Eveleen meant when she said piffle. She was reacting to something that she thought was nonsense. A jazz age term would be applesauce. One can also say balderdash, bull, claptrap, fiddle-faddle, flapdoodle, hogwash, horsefeathers, humbug (Scrooge), malarkey, poppycock, rubbish, tommyrot, twaddle, among other fun and colorful words. Eveleen will continue to say piffle and I love her for it. It is who she is, besides being smart, funny, and adorable. And that’s what’s up with piffle.